In the last game of the month, will Greg Seroka join Kerry Greene and Alex Jacob as 6-time April winners? Yes he will, thanks in large part to a dominating first-round performance. 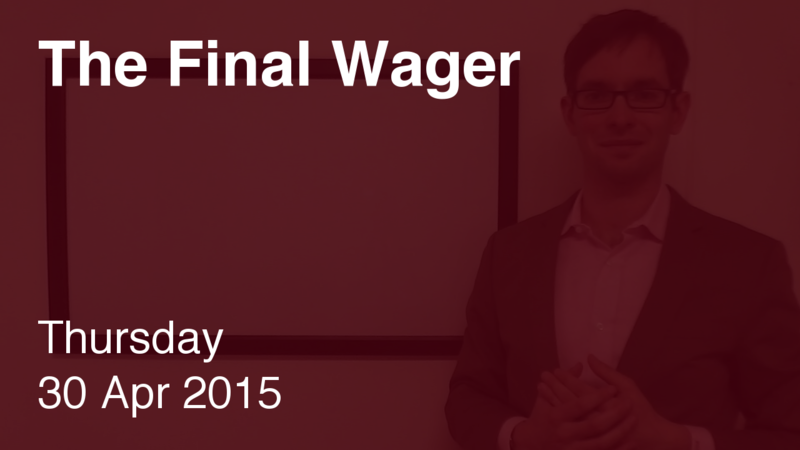 This means another day until he appears on my brand-new sortable all-time-winnings chart. For the second time this week, the third place player is the only one to respond correctly. And for the second game in a row, an utterly incomprehensible Final clue. Does the show expect you to make distinctions between city limits and metropolitan areas? Santo Domingo is much bigger in terms of the latter. This question threw me off, I was thinking of American cities so I thought Honolulu, Hawaii. It just goes to show you. I am often thrown off by indirection but not this time. Once I figured out that it referred to a city on an island I found it easy. I suppose NYC is not an awful guess if you think the city is confined to Manhattan Island, which it is not. And I also don’t consider Victoria, B.C. a terrible response if you have never been anywhere near it. I have visited it and knew it wasn’t that populous. Wikipedia confirms that, listing the population at only 80,000 in the actual city and 350,000 in the metro area. But Havana occurred to me immediately. Agree that there is some ambiguity here … but nothing is as bad as last night’s Final Jeopardy. According to Wikipedia, Santo Domingo is much larger than Havana — 3,525,000 vs. 2,135,498 — looking just at the city limits, as of 2010. Why incomprehensible? After all, it says “The Americas,” not America.